Schendt Engineering Corp. was the prime consultant for this project. 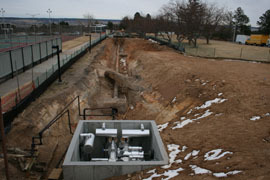 The project generally involved replacement of the HTHW distribution system serving three (3) buildings in the Falcon Club area at the USAF Academy. The distribution system consisted of approximately 2,800LF of a Class A conduit system with three (3) new precast valve vaults. The project traversed a high traffic area with one street crossing, and two (2) driveway crossings. The SEC team performed site surveys, utility locates, and developed as-built drawings of the existing topology and utilities based on these surveys and locates. A proposed new construction plan and profile was then developed. During the final stage of design, the SEC design team potholed to locate and establish the elevations of the existing utilities, performed a detailed survey of the site and detailed out the plan and profile of the distribution system. The new distribution system consisted of a Class A conduit system with 3” carrier pipes with 3” of mineral wool insulation on the carrier pipe, one inch of polyurethane insulation on the conduit, and an HDPE outer jacket with pressure testable joint closures. Valve vaults were provided at the high and low points within the system to allow venting of air and facilitate draining of the system. 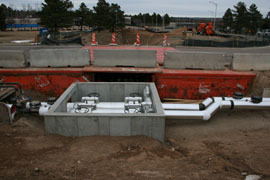 The piping systems included air collection chambers and drains with tandem vent and drain valves. Vault design incorporated ventilation openings, access hatches, ladders and a French drain. The piping in the vaults were insulated with mineral wool insulation with an exterior aluminum jacket to protect the insulation. Existing insulation and paint materials were sampled for asbestos. Asbestos and lead based paint abatement plans were included for demolition. 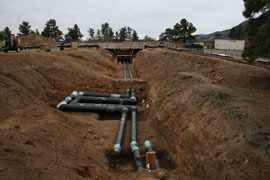 Due to a new interpretation of the environmental regulations, the Academy required removal of the existing direct bury piping system.